Amy Dixon was a hard-working college student when her vision began flashing and strobing. “It’s like a short-circuiting television that’s only getting static,” she explains. 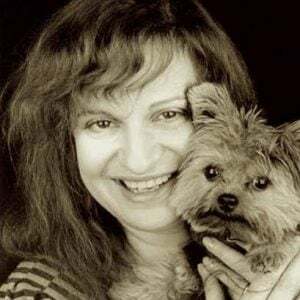 Diagnosed with a rare autoimmune disorder combined with an eye disease, she went on steroids and eventually chemotherapy, but over the years she gradually lost most of her sight. A career as a wine specialist required frequent trips to European vineyards, which became difficult as her vision decreased. “I was terrified to be in crowds because I couldn’t walk without knocking over people. I couldn’t see anything below waist level,” she says. So Amy learned to use a white cane. 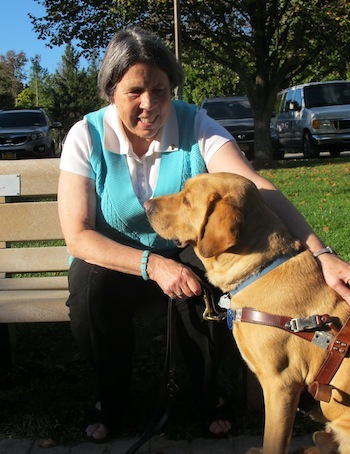 She contacted Guiding Eyes for the Blind, a facility headquartered in Yorktown Heights, New York, where she fell in love with a yellow Labrador Retriever named Elvis. 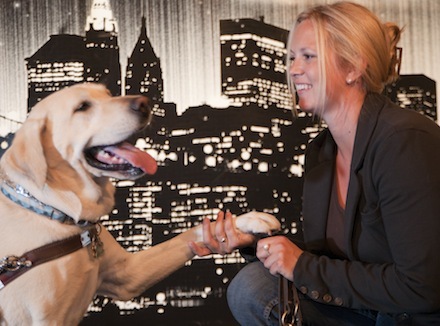 Guiding Eyes for the Blind understands why a visually impaired person would choose a dog over a cane. Ricky Jones can testify about this. He was using a cane to cross a busy intersection in October 2008 when a car ran the red light. Though Ricky heard the car, he knew he had the right of way and assumed the driver would stop. But, distracted by his cell phone, the driver didn’t notice the red light — or the man with the white cane crossing the street — and plowed into Ricky. Ricky was hospitalized for a long time, followed by months of physical therapy. By the time he was ready to begin living a normal life again, he was petrified. He didn’t want to go outside, and kept taking time off work because he was afraid to travel there. 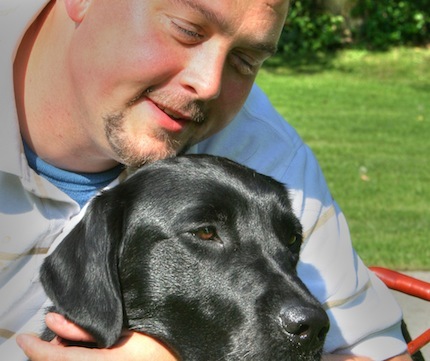 At Guiding Eyes, Ricky was matched with a dog named Pearson. As soon as Ricky returned home from campus training, he went to the spot where he got hit by the car. Guiding Eyes for the Blind breeds and trains all of its dogs. Of the approximate 500 dogs bred every year at the facility, only half make it through the program. “We’re looking at the size of the dog and the trainability. They have to be able to stop somebody if they’re moving out into traffic. So very small breed dogs are not going to work, and the really big dogs would not fit on public transportation. Labradors and German Shepherds are the smaller of the large breed dogs,” says Brier. Health is another factor. Many of the issues that are common in Labradors have been bred out of their line, so the school can be confident that its dogs will be out in the field longer and be happy and healthy doing their job. In terms of temperament, the school looks for the desire to be with people and to want to learn. Adaptability is also a concern. “Our dogs get put into a lot of different situations and handle it with ease,” says Brier. But that, she points out, is also part of the Labrador’s personality. After going through a process Amy Dixon calls “Match.com for dogs,” she was paired with Golden Lab named Elvis. 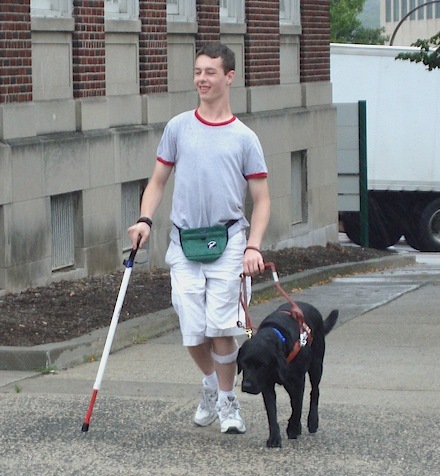 Guide dogs are specifically trained to navigate around obstacles. The puppies that are earmarked for more formal training go home to a foster family — “puppy raisers” — for 16 to 18 months. “That family has certain tasks that have to be checked off every month,” says Amy. This could include going to a soccer game, the grocery store or a movie theater. They are trained on elevators and escalators, walking on different types of surfaces, or riding on trains and buses. Once the dogs turn 18 months, they go back to the campus. They are given a one-day test, and at that point the school makes the next cut by determining which dogs show the skills and aptitude for guide work. Then the work begins with a professional trainer. Guide dogs are specifically trained to navigate around obstacles. “There are often things on the sidewalk that could be frightening to someone without sight,” says Brier. Becky Barnes has been using a guide dog since 1995. Lawson, a yellow Lab, is her third dog. She has experienced both home training and on-campus training. She believes it’s helpful to be around people going through the same thing, especially for those who are still adjusting to being blind. “It helps to be around other blind people and learn how they do things; to be able to grumble about the same things and rejoice about things that someone in the sighted world might not understand,” she says. So what happens when a guide dog retires? Guide dogs often return to their puppy raisers for retirement because their person, who now has a new guide dog, often can’t care for both the new dog and the retired dog. A guide dog is never left alone, so when the person goes off with the new dog and leaves the other at home, the older dog may get depressed and develop behavior issues. “Once the dog retires, the objective is that the harness should never go on his back again,” says Amy. But that doesn’t have to be the end of their love affair. Becky had a black Lab named Flyer who worked with her for almost 9 years. He’s now retired and living in Ohio with his puppy raiser. “My husband and I got married there last July. We’re good friends, and I get to see Flyer,” says Becky. Editor’s Note: This article is part of an occasional series about various professional working dogs in the United States. Next, we spotlight bomb-sniffing dogs.